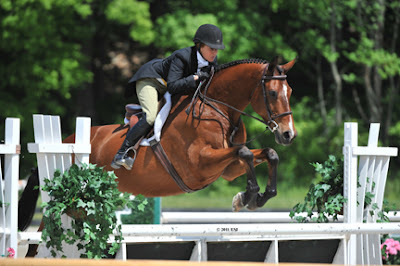 Jenny Fischer and Freedom's Storm on course in the $5,000 Devoucoux Hunter Prix at HITS Saugerties. SAUGERTIES, NEW YORK (June 5, 2011) — For the second week in a row the $5,000 Devoucoux Hunter Prix has been the top draw on the schedule at HITS-on-the-Hudson in Saugerties, New York, proving once again that the Diamond Mills $500,000 Hunter Prix Final has ignited a new level of excitement in the sport of hunters. A record high of 70 starters competed in Saturday’s feature class for hunters with Jenny Fischer of Montgomery, New York taking top honors aboard Stormy Good’s Freedom's Storm. HITS’ Lisa Engel is joined by Guillaume Jullienne of Devoucoux to present the awards to Jenny Fischer and Freedom's Storm for their win in Saturday’s $5,000 Devoucoux Hunter Prix at HITS Saugerties. Ten show rings were in action yesterday, as picture-perfect weather had exhibitors out competing in full force. 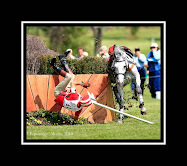 Rian Beals of Saugerties, New York set a stunning course for the $5,000 Devoucoux Hunter Prix which, in addition to drawing record entries, also drew a large crowd of spectators. In the first round, Fischer and Freedom's Storm posted a score of 87 which put them in third place heading into the second round. Heather Ann Cahill of Bedminster, New Jersey and Carly Fischer’s Donatello scored an 88 and sat in the number two spot, while the first round’s top spot belonged to Schaefer Raposa of Wellington, Florida who scored an 89 aboard Kimberly Jungherr’s Cassleton. The top 15 pairs returned for the second round and that’s when Fischer and her ride stormed back with an outstanding effort that earned them a score of 89 for a total of 176, to take the lead. Raposa and Cassleton scored a 175.5 total to take the red ribbon. The third-place award went to David Oliynyk of Plainville, Massachusetts aboard Lori Gaudet’s Generous who scored a total score of 174.5. 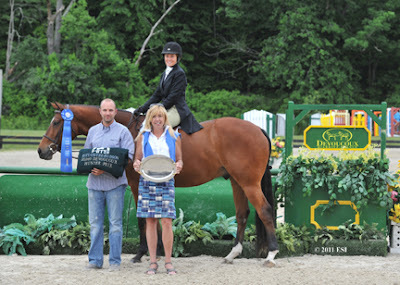 Rounding out the top five in the class were Amanda Starbuck of Ridgefield, Connecticut with Connecticut-based Stepping Stone Farm’s Rio Bronco in fourth place and David Wilbur of Simsbury, Connecticut with Marianne Huss’ Cameron in fifth. 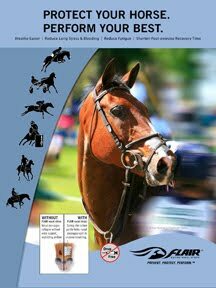 Show jumping at HITS-on-the-Hudson II continues today with the $75,000 HITS Grand Prix, presented by Pfizer Animal Health, as the main event in the majestic Strongid C 2X Stadium. Some of the top equestrians in the world including McLain Ward, Todd Minikus, Jeffrey Welles, and Peter Leone will shoot it out for the first place check.